Please reference the following resources that will help you train for kicking, strengthen your muscles to prevent injury, and increase your kicking power. I highly recommend all of my kicking students to strengthen their hip flexor muscles and kicking muscles. It’s important to stay healthy and injury free and a great way to do this is to strengthen your hip flexors, quadriceps, and hamstrings muscles. Speaking from experience, I know how important it is to train your hip flexor muscles. At a kicking workout I tore my hip flexor and it is a hard injury to recover from! Please reference the following resources that will help you train for kicking, strengthen your muscles to prevent injury, and increase your kicking power. Why Buy: To strengthen your hip flexor muscles and help increase the ‘fast-twitch’ muscle fiber speed of your legs. This can help contribute to a faster kicking leg and improved power as you kick field goals, kickoff, or punt. If you want to kick longer field goals, kickoffs, or punts; I recommend picking up this program! Why Buy: This is a complete eBook to help teach you everything you need from kicking fundamentals, techniques, form, practice routines, training program, weightlifting program, strength & speed tips, kicking equipment suggestions, and mental game preparation. This book is loaded with everything you need to take your kicking and punting performance to a whole new level! Why Buy: This is it! The first truly ‘complete’ 2-Disc Instructional kicking video ever released. It features over 2 hours of quality field goal, kickoff and onside kick instruction with Coach Brent Grablachoff. Over 10 chapters of dynamite instruction with on-field kicking drills, in-gym training, stretches, practice plans, mental strategy, fundamentals, technique and a whole lot more. 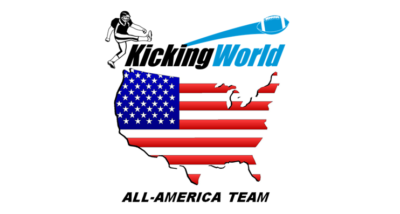 You can even pick up the eBook with the DVD and save $10 in the Kicking World shop! Why Buy: Simply awesome. Coach Brent & Jesse give you their all in this feature-packed DVD with 8 chapters of punting instruction, drills & strategy. The in-gym training, stretches, practice plans & mental strategy from the Kicking DVD are also included in this new Punting DVD.